Every sprinting event in track & field has four main phases: the start, acceleration, maximal velocity and deceleration. If they were to force rank the importance of each, most coaches would agree that the acceleration phase holds pole position. Still not convinced? Look at this this way. Although a poor start can greatly affect the outcome of a race, a runner can still place if he or she recovers with solid sprint acceleration technique. Also, a sprinter must use his or her acceleration to hit the third phase—maximal velocity—at which they run for the bulk of the race. Finally, deceleration is inevitable regardless of the quality of a runner’s acceleration. Of course, this is easier said than accomplished. To truly nail the acceleration phase, athletes need to put in the time and training to perfect this most important part of their race. The only way a runner can achieve his or her maximal velocity is to have a solid build after the start. Here are three drills to build strength in the acceleration phase. I love having my girls run bleachers, and not because I enjoy torturing them. The high knee raise and forced angle of the body perfectly mimics the beginning movements of the start and acceleration phases of a sprint race. 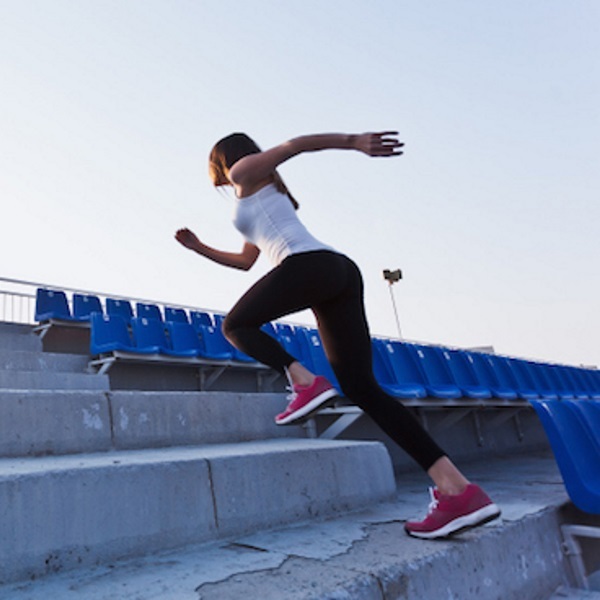 The distance traveled up the stairs is a natural build in speed; the slow jog back down provides the rest period. Have your sprinters skip every other step, because that reinforces that strong angular power line when coming out of the blocks. This drill reinforces the power line at the start of the race and teaches sprinters to build speed gradually by using visual cues. Once they have done this enough, they will no longer need visual cues. Sprinters will innately feel where they should build. Place markers every 5 meters for a total of 30 meters. Sprinters line up at the start. On “Go,” they fall forward into their start. Sprinters increase speed at each marker, aiming to hit maximal velocity exactly at the last marker, not before. As sprinters get used to this drill, increase the acceleration zone up to 50 total meters. In this workout, sprinters work on building speed at 20-meter intervals. The top speed achieved in each interval is held during the 20-meter “float,” or relaxed interval. Sprinters use the next 20 meters to build more, then float another 20 meters, and so on. Rest one full minute after each set; complete 4 rounds for a total of 1,600 meters. Set distances can be tailored for each event (200-400-200 x2 for open 200 sprinters; 400-800-400 x1 for the open 400 sprinters).